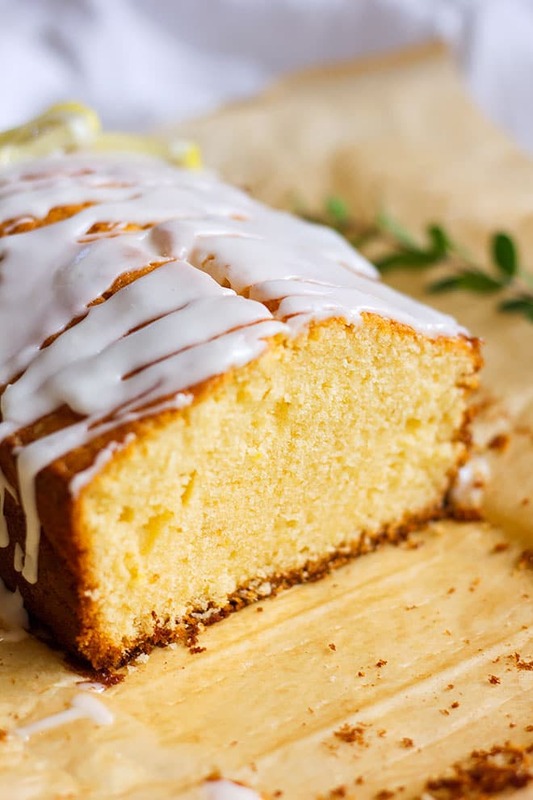 Lemon Pound Cake is a delicious pound cake with tender crumbs and perfumed with lemon zest. Adding lemon juice and zest to this pound cake makes it a special treat. It served with icing made of lemon juice and confectioner’s sugar, and that not only adds to its flavor but turn it into a gorgeous cake. What’s in a Lemon Pound Cake? The authentic pound cake has eggs, butter, sugar, and flour. It called pound cake since all the ingredients weigh a pound but recently and to make this cake lighter in calories, milk, sour cream, and a mixture of butter and oil is introduced. The goal here is to maintain the texture of the crumbs found in a pound cake which is tender and melts in your mouth, but also add different flavors to the recipe and take it to another level. In my Marble pound cake recipe, I have added chocolate and gave the pound cake a marble effect; the cake turned out amazing! 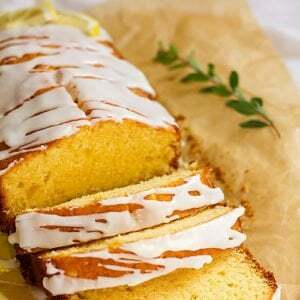 In this lemon pound cake recipe, we will be adding fresh lemon juice which may dry the cake. Hence the buttermilk is also added to keep the pound cake moist. You can use sour cream, but the cake will get dense. It is best to taste the lemon before adding its juice to the pound cake. Sometimes the lemon will look fine from the outside but will taste bitter, that bitter taste will take over all other flavors is this lemon pound cake and will eventually ruin the whole experience. 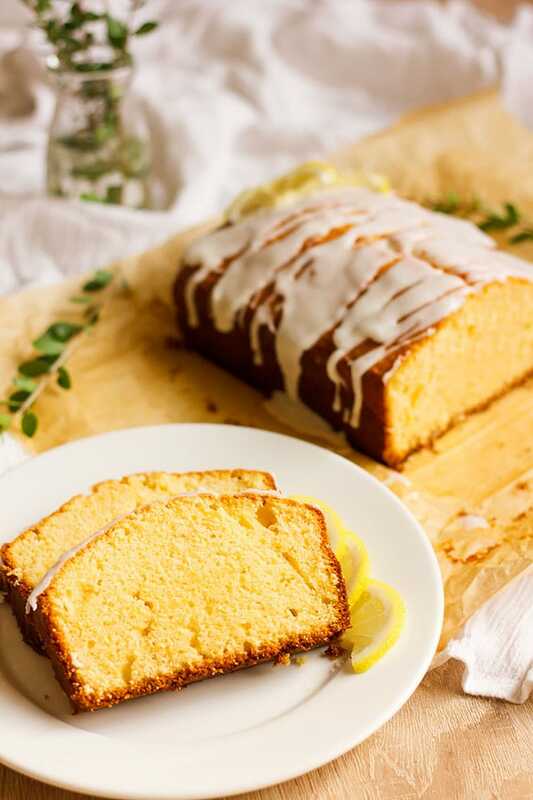 How to make Lemon Pound Cake? Having all ingredients at room temperature will make the process of mixing faster. In a bowl, beat the butter until light in color, then add the sugar and beat for 5 minutes. This step is called creaming, and it is important when making a pound cake or butter-based cake, it helps the sugar dissolves completely. Add the eggs one at a time to the previous mixture. Adding the eggs one at a time and beating for two minutes after each egg, makes the batter lighter and create tender crumbs. It also helps in reducing the smell of eggs. In this last step you have to add half the flour mixture and beat until combined at medium speed, and then pour half of the buttermilk and beat for few seconds and then repeat this step. You will have a thick batter. Preheat the oven and line the 9”x5” baking pan with parchment paper. Pour the thick batter and bake until a toothpick inserted in the middle of the cake comes out clean. Please read the notes in the recipe card to prevent baking a dry or flat lemon pound cake. How to store Lemon pound cake? 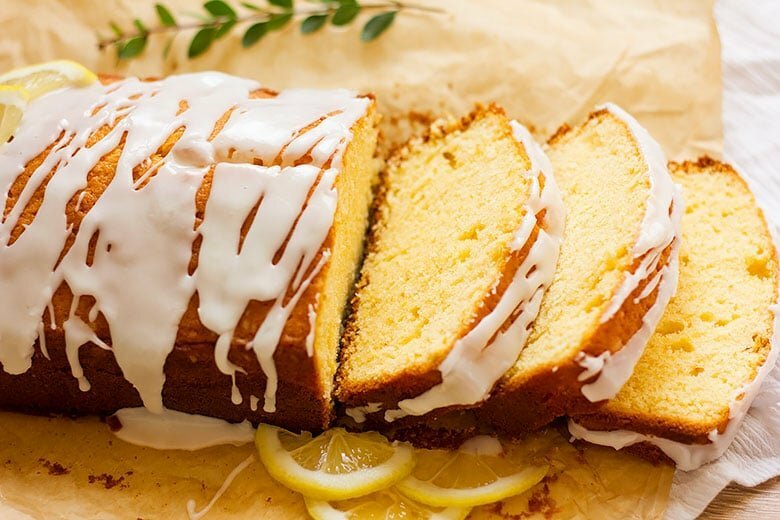 If you want to make the lemon pound cake ahead of time, then pour the icing only when it’s time to serve it. The pound cake should be wrapped in a plastic wrap and placed in an airtight container at room temperature. 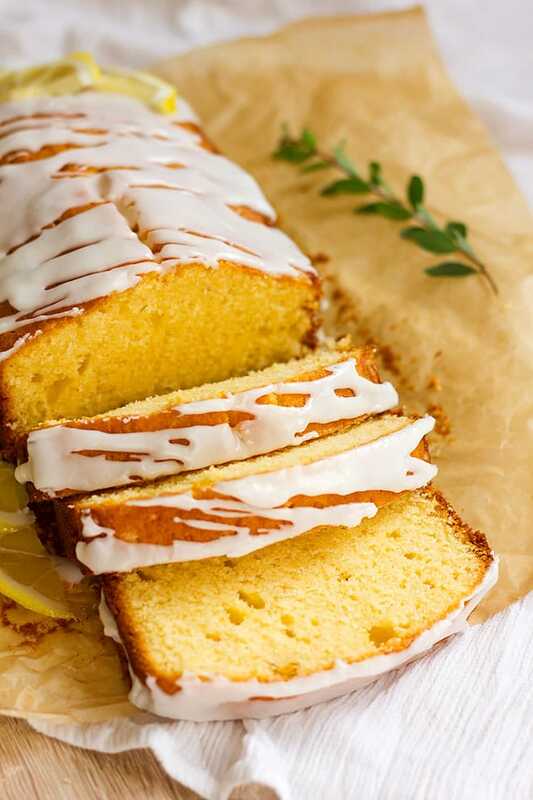 Placing the lemon pound cake in the fridge will make it dry and tasteless. Do not cut the cake in slices and then store it, doing so will make the pound cake dry. When you store the pound cake properly, it can taste even better the next day, but since this is a butter-based cake you should consume it within three days before it loses the soft crumb texture. Other Pound cake recipes you will love. This lemon pound cake is perfumed with lemon zest, moist with tender crumbs. It is a crowd pleaser and looks so good to impress your guests. Preheat oven to 350F/180C. Line a 9”x5” baking pan with parchment paper and keep aside. If the cakes you bake in your oven come out dry most of the time, preheat the oven to 325F/ 162C instead. Sift the flour with baking powder, baking soda, and salt. Keep aside. In a bowl, Add the butter and beat until light in color, this may take 2 minutes. Add the sugar, lemon juice and lemon zest to the butter and beat for 3 to 4 minutes on medium speed. Add the vanilla then add the egg one at a time, beat after each egg for few seconds. Add half the flour to the previous mixture and beat for few seconds. Add half the buttermilk and beat on medium for few seconds. Repeat the previous two steps ending with the buttermilk and beat for few seconds. Pour the batter in the previously prepared baking pan. Place the pan in the middle shelf of the oven and bake for 50 minutes or until a toothpick inserted in the middle of the cake comes out clean. 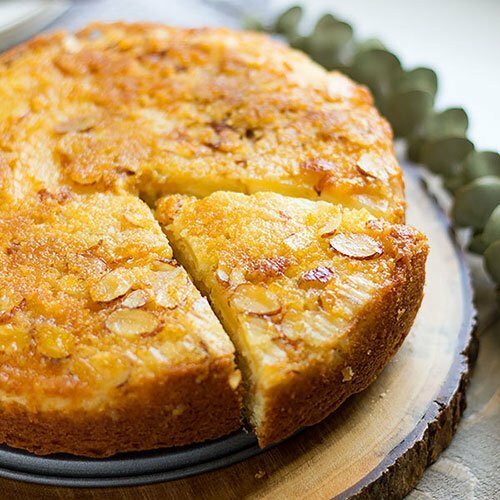 Remove the cake from the oven and place over the cooling rack while in the pan for 3 minutes. Remove the cake from the pan and place on cooling rack to cool completely. Gradually add the lemon juice the to confectioner’s sugar until you get a pourable but thick icing. Pour the icing over the pound cake and let it set for 4 minutes before cutting the cake. Do not overbeat the eggs but beat until combined with the butter and sugar. Preheat oven. If your oven doesn’t prompt you when it reaches the required temperature, then give the oven 12 minutes to heat before baking the cake. Do not open the oven door until 15 minutes have passed from baking. The baking pan shouldn’t be bigger than 9”x5”. Do not overbeat the batter. Taste the lemon before using its juice, some lemons look good but have a bitter taste. Do not pour the glaze over the cake while it’s warm or hot. Read the recipe before making the cake. Use proper measuring spoons and cups. Hi there! 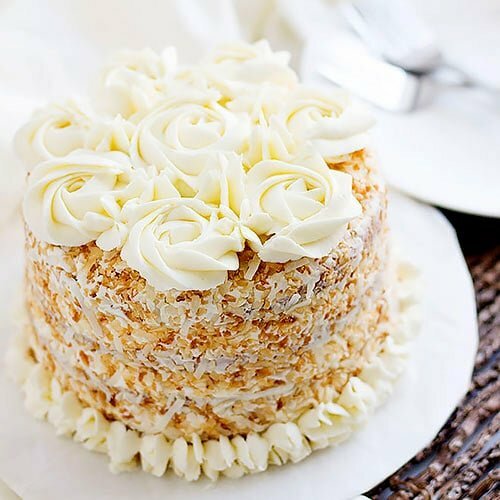 Your cake recipe looks so gorgeous! 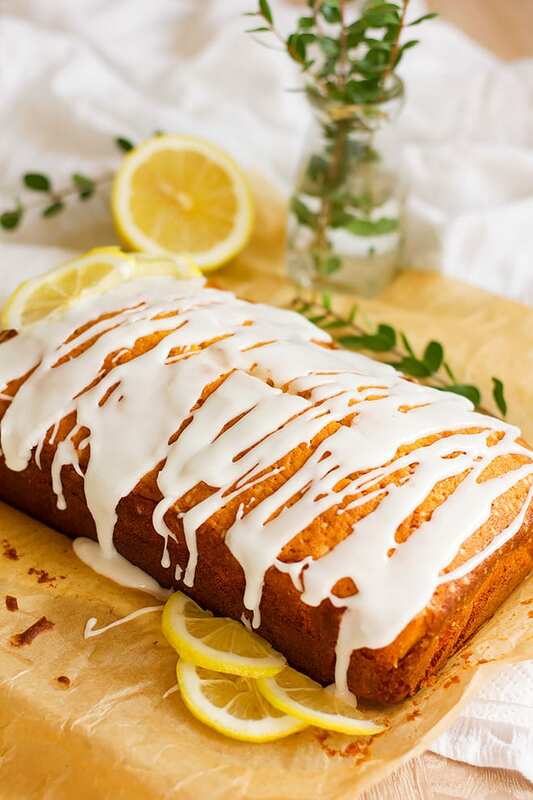 We love the lemony and zesty flavours in sweet and was concentrating taking notes of your recipe when I realized that it misses the quantity of lemon juice and lemon zest to use in it. Could you please specify them! I’m craving to do your cake. Hi Yolanda, Thanks so much for the heads up, this happens at times when importing the recipe to the recipe card! I’m glad that you read the whole recipe before making the cake 😉 .. I have updated the recipe and I hope you enjoy this cake as much as we did! As promised, I made the cake, and I must say that it is … gorgeous! I just increased the quantity of lemon in both the cake dough and in the icing. I was certain to do it because my family loves that lemony flavour, and actually, they loved it. Thanks a million for the recipe! 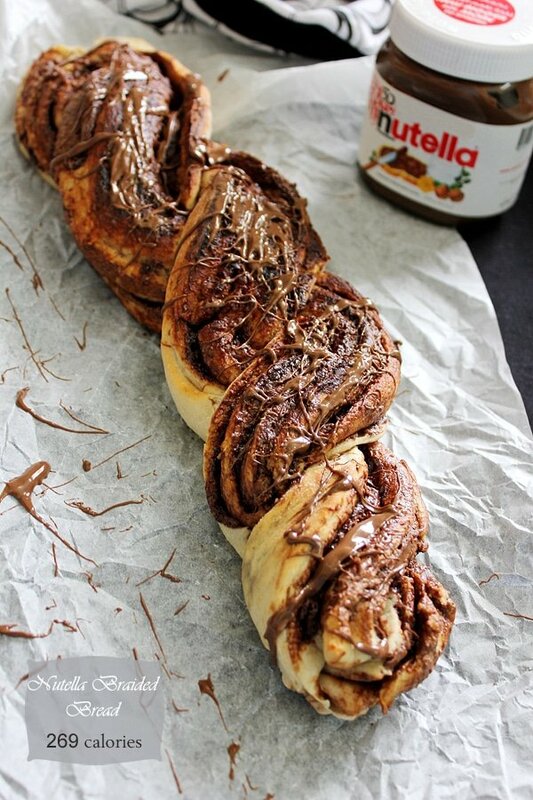 Wow this looks just so tempting! Trying this lemon cake at the soonest. 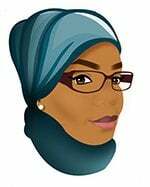 Thanks Muna!